We Americans love our dogs! More than ever we're recognizing the importance of having a dog in our lives, especially a rescue dog or a purebreed dog from a reputable breeder. We want the best for our dogs! Review website TTPM.com recognizes how much we love our dogs. That's why they do reviews on all kinds of pet toys and more. They also host giveaways and contests too! And starting today, they want to see your dog with their favorite toy. TTPM is hosting a photo contest for prizes, including toys and PetSmart giftcards! Enter a picture of your dog with their favorite toy between Wednesday, Aug. 26 and Sunday, Aug. 30. Then people will vote on the cutest pictures from Monday, Aug. 31 through Tuesday, Sept. 7. Winners will be announced on Sept. 9. There will be three categories of winners: small, medium and large dogs. 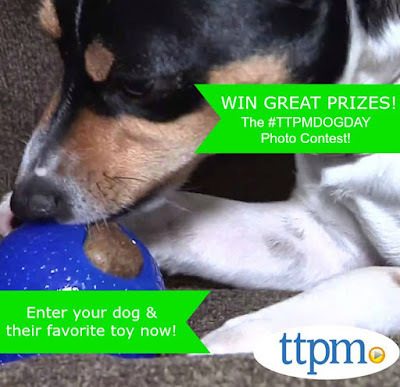 So head to TTPM.com to read the complete rules and submit your dog's pic, or post it on the TTPM Facebook page. What a fun contest! I don't know what Luna's favorite toy is since she goes through them so quickly!